Slightly Substandard Review of the Game That Does Not Even Need to be Reviewed Because it is so Good. Reviews Exist for Bad Games like Batman Forever on SNES. I really have no idea where I could get started on this one. What really has not already been said of Metal Slug 3? Really, what is there left for me to say?? ECM gave this game a perfect score late last year in Gamefan, Shawn thought so much of the game that he pursued an English release and I have never read a single, genuinely negative thing about it. After all, who could hate a game like Metal Slug 3? 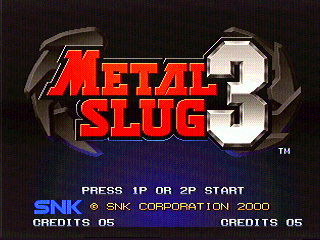 Being one of the last true SNK releases produced by SNK, Metal Slug 3 represents the pinnacle of its genre. This game embodies all of those great run and gun shoot-‘em-up games of the arcades glory days and the previous Metal Slug games in one tidy package. There is just something about this game that brings back fond memories of playing all those great old-school CPS1 and MVS games at the arcade. The huge sprites, the simple but elegant game play and the pulse pounding music are really, really arcade. I guess, the same could be said of all Neo Geo games, but this one seems to get it spot on. By that, I mean the experience. You would not believe the things you will see this game delivering. All the things you have heard about the animation are true. You would not believe how well these sprites animate. Large or small, these things are fluid. Don’t even get me started on Monkey. This little guy is co cool it hurts. Monkey is essentially a helper in the same vein as one of Strider Hiryu’s satellites. They are cool to have, don’t really help that much, and disappears once you get hit or die. What sets monkey apart is his machine gun, diaper and the way he animates when he stands still. He eats things off the ground!! It’s so cool. He just eats thing, faster and faster and faster. This kind of animation needs to be rewarded. It just might be the coolest thing ever. It’s that cool. Seriously. 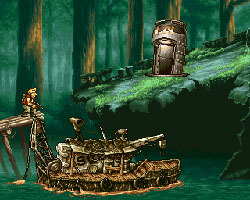 Metal Slug 3 really plays the same as it used to. It just adds new levels and things to ride and new ways to interact with levels. You get an Elephant, an ostrich, a submarine, a monkey, a jet pack and a monkey; one very cool monkey. Now, playing the same as the other games in the series is no crime. The Metal Slug concept and game play are pretty sound. I still don’t know why you can’t shoot diagonally but the game is built around the fact that diagonal shooting is not really necessary and some weapons let you get around that, like the heavy machine gun. You will find new ideas here and there, though. The jetpack levels are a blast and the new weapons are pretty cool. The music is pretty solid too. Some tracks get reused, but there are a slew of new ones, which are really cool. You will love the new take on the Metal Slug theme on level one. In fact, all of the tracks (old and new) are extremely pleasing to the ear. I have the highest regards for the dude in charge of making Metal Slug music. Probably the most significant change (besides the monkey) is the addition of multiple paths. A very, very welcome feature to a game like Metal Slug, these paths allow you to change up the way you chose to play through a level and do the all important job of adding replay value. Metal Slug 3 has replay value in spades when compared to the previous chapters. Obviously, the developers thought of the home user when they decided to add these new paths. They really do make the Metal Slug experience more…surprising, especially when you discover an area you have not encountered before. All of that above about sums up my opinions on the grandeur of Metal Slug 3. Truly, this is a Neo Geo game worth the admission price and one that should be in your collection. Like any other Metal Slug out there, this one will please. In conclusion, I would like to apologize for the rather short overview of Metal Slug 3. It is just that there has been so much said and I just wanted to chime in with my two cents, Y’dig? Right on. Graphics: 10/10 –2D perfection. Y’aint getting graphics better than this when it comes to a 2D side scroller; some truly amazing scenes and animation. Sounds/Music: 9.5/10- Very, very pleasing stuff. That opening track is awesome! Game Play: 10/10- It’s Metal Slug which means it pretty solid, playable stuff. Tight! !